[ Printed First World War pamphlet. ] A Call to War Workers of the Engineering and Shipbuilding Industries. London: Hayman, Christy & Lilly, Ltd. 1918. 8pp., 8vo. In fair condition, with light signs of age and wear. Begins: 'This address is a call from the work bench. The writer is not a paid official of the State or the Trade Union, and has no ambition or intention to become either.' In the author's view 'the disconcerting truth is that, particularly during the past twelve months, production per head has dwindled, and energy has relaxed far beyond the limits assignable to physical weariness or even mental apathy'. Five items relating to the Amalgamated Engineering Union, Birmingham Branch No. 304BE, including two minute books, 1943-1956 and 1957-1980; 'Proposition and Entrance Book', 1966-1976; and two unemployment benefit books, 1956-1978 and 1966-1979. This small archive casts invaluable light on British labour relations at a local level during a turbulent economic period in postwar British history, with specific day-to-day information about persons and events. The two minute books, 1943-1980, are both 4to, with the first of around 200 pp and the second of around 150 pp. Both texts clear and complete, and some matter loosely inserted (including a letter from an individual pursuing a complaint against the branch). In worn bindings, with the boards of the second volume detached. No date [1950s]. London: The Amalgamated Press, Ltd., The Fleetway House, Farringdon Street, EC4. Dimensions: 17.5 x 13.5 cm. 64 pp. 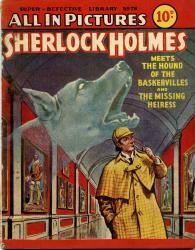 In original coloured paper covers. Priced at 10d, and thus the British edition and not one produced for the foreign market. Good and tight, on browned paper. 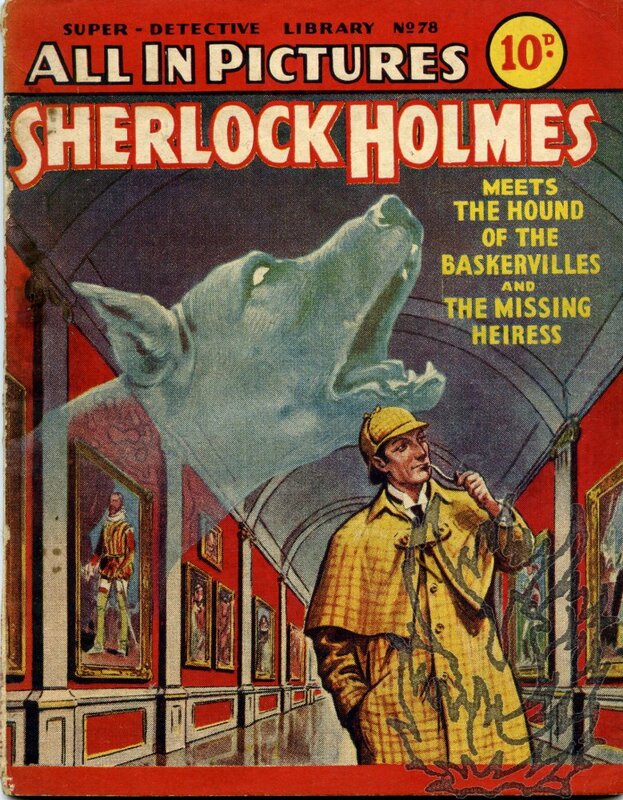 Attractive image on front cover showing a bemused Holmes puffing on his pipe as he wanders down a country-house corridor whose walls are covered in paintings, while the spectral figure of the hound's head looms above him.Covers lightly worn and slightly damaged by the rusting of the staples. Both stories are told in comic strip form.